The perennial tree flowers twice a year, with an annual average nut yield of 12 kg/ tree (5 year old) and 100 kg in 20 year old tree. Fruiting starts at 4-5 yrs. a five year old tree yields 3 kg kernel, ie.2.1L oil per tree. The highly acidic and viscous oil was found to yield inferior quality biodiesel using conventional conversion processes, but modified production processes led to better results. As part of the study, researchers conducted engine tests using B5 and B20 biodiesel produced with Beauty leaf tree oil and found that it performed as well as conventional diesel. 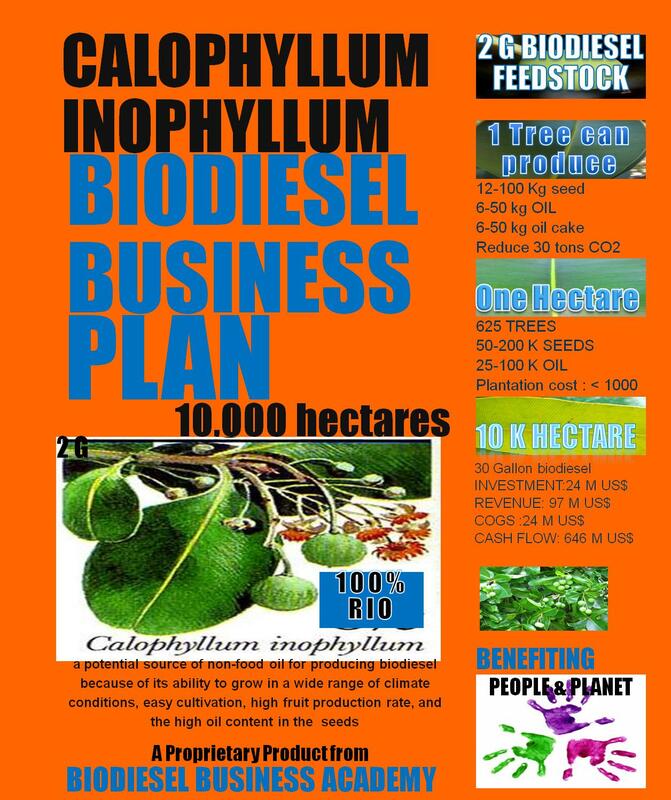 The Biodiesel Business Academy (BBA) included Calophyllum inophyllum in its research portfolio on the basis of certain solid credentials: a higher recovery and quality of oil than other crops, no direct competition with food crops as it is a edible source of fuel, and no direct competition with existing farmland as can be grown for both purpose: same this tree can be established as a biodiesel feedstock crop either in monoculture or in mixed planting with other biodiesel feedstocks or food crops. Many studies have shown there is enough land available to produce more food, more feed and more biofuels. Though the discussion of indirect land use change (ILUC) caused by biofuels is not scientifically supported, the Calophyllum inophyllum does not causes land use change. Contrary to it Calophyllum inophyllum Contrary to it is targeted for marginal lands which are unproductive, often because of salinity and for water logging. It is claimed to be highly salt tolerant and as such is used for reforestation in the dry, saline wasteland. Biodiesel can make a large contribution to the world’s future energy requirements; this is a resource we cannot ignore. The challenge is to harness it on an environmentally and economically manner and without compromising food security. Calophyllum inophyllum has attracted attention as pressure mounts to find sustainable alternative fuels to help meet countries' renewable energy targets and cut greenhouse gas emissions, without interfering with agricultural production. Researchers at BBA has honor to establish this untapped resource as alternative source for Bio- Diesel industry of future as Calophyllum inophyllum is a strong candidate to contribute significant amounts of biofuel feedstock. CJP estimates the key financial figures for a company’s Calophyllum inophyllum Project over 10 years. Th3e projections include abbreviated income and cash flow statements and a balance sheet.